Air Canada is planning to grow its CY2015 capacity at higher levels than most of its North American global airline peers as its new low-cost airline rouge has exceeded expectations, which is giving the airline confidence that the lower cost capacity it plans to introduce should help the company reach its medium term cost reduction targets. The airline is not yet offering unit revenue or yield guidance for CY2015, but given that its focus during the past couple of years has been adding capacity into leisure markets, the decline in yields Air Canada has recorded throughout CY2014 are likely to carry over into CY2015. As Air Canada prepares for a capacity push in CY2015, it continues to record a solid financial performance in CY2014, posting strong results in 3Q2014 despite falling yields and unit revenues. Air Canada projects a system wide capacity increase of 9% to 10% in CY2015 compared with growth of 7% to 8% in CY2014. Deconstructing the increase, Air Canada expects that 55% of the overall rise is attributed to continued expansion of rouge, with 38% of the capacity increase allotted to international markets operated by Air Canada mainline as the company continues to take delivery of new Boeing 787 widebodies. The airline is adding six of the jets in CY2014 and two in CY2015. The company forecasts domestic capacity growth of 4% to 5% in CY2015, which is similar to Air Canada’s growth levels in CY2014. Its domestic growth in CY2015 is driven by an increase in transcontinental service as Air Canada positions 777 and 787 widebodies in its Toronto and Vancouver hubs. Air Canada is also replacing eight Embraer 190 mainlines with three higher density Airbus A321s and two A320s. The company explained that it would take delivery of the five narrowbodies ahead of the peak summer season while the eight smaller aircraft are expected to exit the fleet during late 2015. The overlap of the two aircraft types is expected to represent approximately 30% of Air Canada’s estimated capacity growth in CY2015. Air Canada’s rival WestJet also projects domestic capacity growth in CY2015 of 4% to 5%. Most of Air Canada’s similarly sized North American counterparts are also planning capacity increases in CY2015, but at lower levels, roughly less than 3%. In outlining the rationale behind its projected larger capacity increase, Air Canada explained that rouge exceeded its expectations for the peak summer time period in 2014 and the five higher density 777s and 787s allow the airline to leverage a strong geographical position. Its sixth freedom traffic also grew 31% year-on-year during 3Q2014. All of those elements are driving confidence among Air Canada’s executives that adding lower cost capacity into the market place should be margin accretive. Company CEO Calin Rovinescu also explained that “leaving rouge aside”, Air Canada has not grown in line with available opportunities in international markets during the last decade. So it appears Air Canada is attempting to create a global network to rival its US peers. The lower cost capacity touted by Air Canada is also lower yielding capacity as rouge targets cost conscious leisure travellers and the high density 777-200LRs are also deployed in leisure markets, and have a larger economy cabin. A higher percentage of leisure traffic coupled with a 2.6% increase in system stage length resulted in Air Canada’s consolidated yields falling 1.3% year-on-year during 3Q2014 on a 0.2% drop in passenger unit revenues. The company estimated that stage length increase reduced its yield by 1.5ppt. For the 9M ending Sep-2014 Air Canada’s yields declined 1.1%. Air Canada has acknowledged the higher volume of leisure passengers and sixth freedom travellers generate lower yields. But the underlying philosophy is that the company will lower its unit costs at a greater level than yield and unit revenue declines, which will still result in strong financial results. During 3Q2014 Air Canada’s cost excluding fuel fell 2.9%, a decrease greater than the decline in yields. But the airline’s cost performance missed previous guidance of a decline of 3.5% to 4.5%. Air Canada stated that higher than expected employee profit sharing expense and higher depreciation costs were the main drivers in missing its unit cost performance targets. Those two items are also spurring a revision of Air Canada’s FY2014 cost performance. The airline now expects its unit cost to fall from 2.5% to 3.5% compared with previous projections of a 3.2% to 4.2% decline. Air Canada has not supplied unit cost guidance for CY2015, but expects that its unit costs will continue to fall even though it could face some continued headwinds from depreciation. The airline’s refined cost reduction targets should still result in unit cost falling at a faster rate than unit revenue and yield declines as rouge continues its expansion and the full benefits of the high density 777s are realised. Armed with 12 months of operating data, Air Canada estimates the rouge Airbus A319 and 767 aircraft are driving a 23% and 30% unit cost reduction compared to the same aircraft types on the airline’s mainline fleet. Previously, Air Canada has estimated a unit cost reduction of 21% and 29% for rouge’s A319s and 767s, respectively, versus operating unit costs at the mainline. The five 458-seat Boeing 777s have a 20% lower unit cost than the 349 seat 777s in the mainline fleet, according to Air Canada. It is in the midst of adding seats to its 777s, which should spread the cost advantage to more of the widebody jets. The trans-Atlantic was one of Air Canada’s weaker geographical entities in 3Q2014 as yields fell 3.5% and passenger unit revenues declined 4.4%. Air Canada grew its capacity in those markets 20% year-on-year. The decline in yields was a result of Air Canada deploying a higher number of seats into long-haul leisure markets and increased industry capacity. 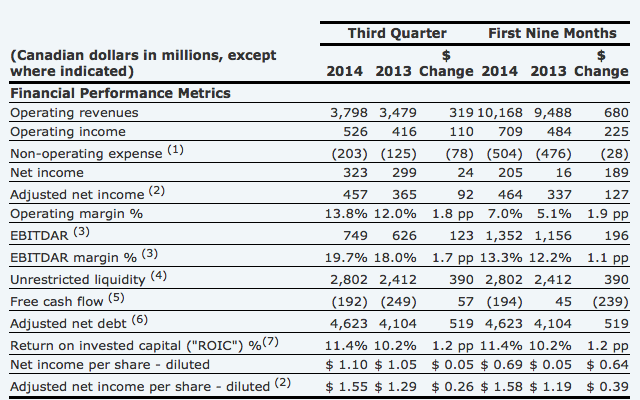 Air Canada recorded the strongest performance in its long-haul Pacific markets as yield increased nearly 5% year-on-year in 3Q2014 and unit revenues jumped 7%. The airline posted a modest 1.6% capacity increase on the routes. The upswing in yields was driven by a favourable performance on all of Air Canada’s Pacific routes, with the exception of Hong Kong, a market where industry capacity increased significantly. The airline also benefitted from CAD13 million (USD11.3 million) in favourable currency effects and an increase in premium economy traffic. In the US transborder market, Air Canada recorded a 3.7% decrease in yields during 3Q2014 as unit revenues fell 0.7% and capacity jumped 12.7%. The airline’s stage length in transborder markets increased 3.8% in 3Q2014, driving 2.2pt of the yield decline. Air Canada increased its domestic capacity by roughly 5% in 3Q2014, and its yields in Canada remained essentially flat with unit revenue notching up 0.8%. The airline explained that the tepid yield growth reflected a higher proportion of lower yielding international and US transborder passengers, and pressure in the highly competitive markets in Ontario and Quebec. Overall, Air Canada delivered a solid 3Q2014 performance as net income grew CAD92 million (USD80.5 million) year-on-year to CAD457 million (USD400 million). Operating revenue grew CAD319 million (USD279 million) to CAD3.8 billion (USD3.3 billion) while operating expenses increased CAD209 million (USD183 million) to CAD3.3 billion (USD2.9 billion), resulting in a 1.8ppt increase in operating margin to 13.8%. The airline ended 3Q2014 with CAD2.8 billion (USD2.4 billion) in cash and an adjusted net debt to EBITAR ratio of 2.8. 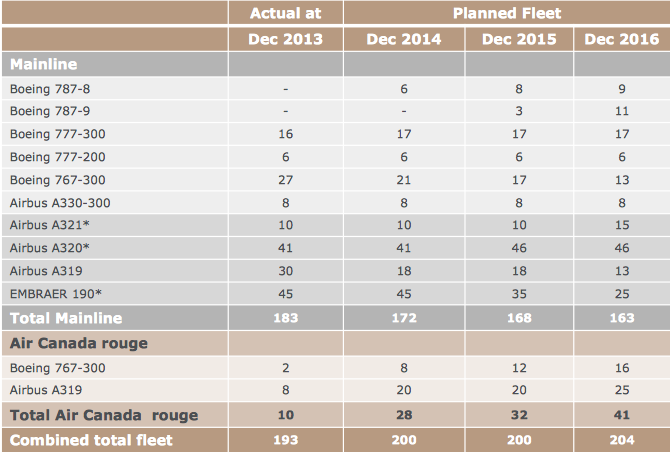 Air Canada is working towards a 15% unit cost reduction (using CY2012 as a baseline) in the medium term, and most of the pillars it has built that estimate on – rouge, high density 777s and the 787 – seem to be meeting or exceeding expectations. The company’s misfire in meeting unit cost reduction targets in 3Q2014 appears to be a minor blip in its efforts to keep its costs in line. Its unit cost decrease was still greater than the decline in yields, so the new business model it has established for itself remains generally on track. Air Canada would be the first to caution that it can by no means declare victory in its business transformation. But for now some of its efforts appear to be bearing fruit as the financial foundation is enhanced.